"I'm not crazy. My mother had me tested." is a common refrain from Sheldon Cooper when his friends question his sanity. When Howard accused Sheldon of being insane for wanting to use artificial intelligence and animatronics to build a new friend to replace Raj, Sheldon replied "I'm not insane. My mother had me tested." So began Sheldon's habit of responding to questions about his mental state by insisting his mother had him tested. Sheldon has told various people his mother had him tested: his friends Howard and Raj, a police officer investigating a break-in at the apartment, and one of the university's wealthy donors who was not enamored with Sheldon. Sheldon even said it to astronaut Howard, aboard the International Space Station, via a video link. When Sheldon's mother, Mary, visited Pasadena she was able to confirm to Leonard that she did indeed have Sheldon tested as a child, though she regretted not following up with a specialist in Houston. When Howard accuses Sheldon of being insane because he wants to use artificial intelligence and animatronics from Disney to build a new friend to replace Raj, Sheldon says "I'm not insane, my mother had me tested." This is the first appearance of Sheldon's common refrain that he's not crazy. In this instance, Sheldon uses the word "insane" as that's what Howard called him. During an argument between Sheldon and Howard over whether Wolverine was born with bone claws, Raj tells Howard to give it up as he's "arguing with a crazy person". Sheldon responds "I'm not crazy. My mother had me tested." When Sheldon answers a phone call from the wealthy Mrs. Latham after they attended a university fundraiser, Sheldon refers to her as a "woman well past her prime seeking to augment her social status by doling out her late husband's ill-gotten gains", before going on to ask her how much money she will be giving him. When her answer evidently didn't please Sheldon, he told her "I'm not crazy, my mother had me tested", before finding out she was actually calling for Leonard. 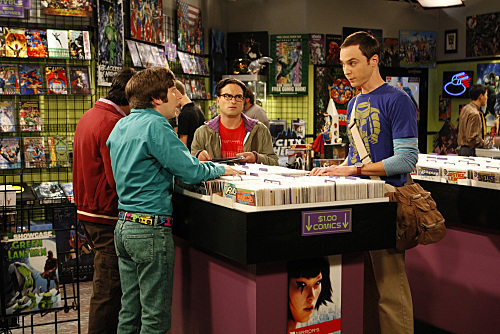 As Leonard, Sheldon and his mother get ready to head out to a sushi restaurant to "try something new", Sheldon points out there's a lot of harm in trying something new, saying "That's why we test out drugs and cosmetics on bunny rabbits." After Leonard accuses him of talking like a crazy person, Mary intervenes to say "Actually, I had him tested as a child. Doctor says he's fine." When Sheldon says "Told you" to Leonard, Mary concedes that she regrets "not following up with that specialist in Houston."